This kit is designed to make the removal of the 2005+ Lotus Elise rear clamshell quick and easy. The contents of this kit when combined with a few modifications, makes the clamshell removal in less than 10 minutes. With the clamshell off, engine service is performed easily, reducing the labor costs for repair work. Part of the modification process is to separate the deck lid hinge mounting points from the firewall. The included hinge brace adds structure back into the hinge support member after the modification is made. The factory steel body shims are taped on to the rear subframe and upper rollbar mount. The aluminum Radium shims bolt in place for a more permanent solution using stainless steel countersink hardware. The billet spacers are all anodized black. They take place of the steel roll of body shim washers. 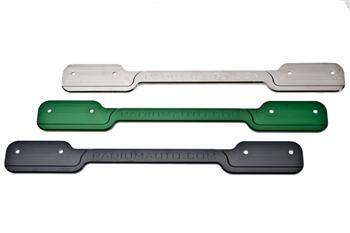 The body shim spacers are anodized green. The billet aluminum clam hinge braces are available in three finishes: Titanium Silver Nickel-Plated, Bright Dip Black Anodized, and Radium Green Anodized.